When Aarti Khosla opened Le Rouge a little over a year ago, she followed her dream. She wanted to turn her new spot under the old Sally’s Place into a fantastic chocolate shop. And she did. Now, Le Rouge is more than a spot to enjoy artisanal chocolate. It’s also a meeting place to share ideas. Once a week, women entrepreneurs are invited to pitch their plans, products or services to prospective clients. Aarti calls it “your own open house. Invite your own audience.” There is no cost. Aarti has already been contacted by a woman selling jewelry for a trunk show, a travel agent and a therapist. Word is spreading quickly. Le Rouge is a tiny space — seating only a dozen or so people. But it has a very big heart. 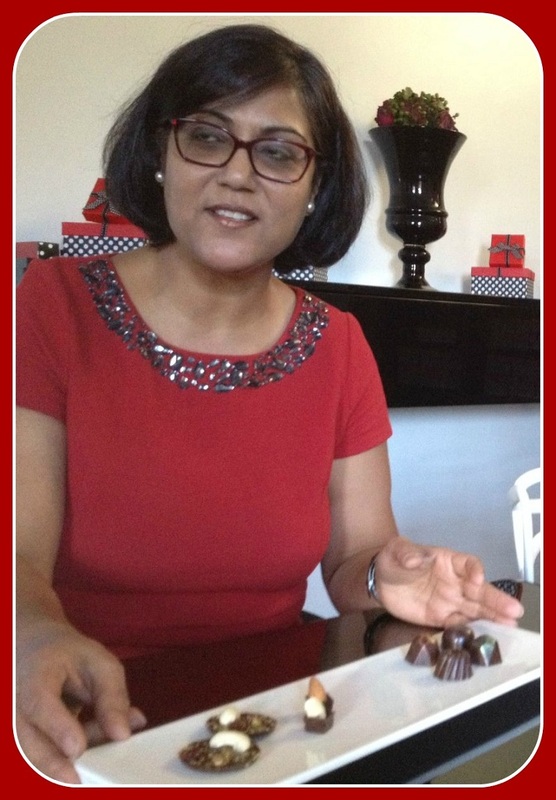 This entry was posted in Local business, People and tagged Aarti Khosla, Le Rouge chocolates. Bookmark the permalink. Such a fabulous idea. Aarti is lovely and her chocolates are to die for. The first time I shopped there, I needed a Hanukah gift and happily left with a box of beautifully stamped gold & chocolate coins. They were delicious, elegant and much appreciated by my hosts. She was so helpful and the in store sampling was fun! Thank you for your kind words Susan. I am trying to spread happiness, one chocolate at a time…..
Aarti is really an artist. her chocolates are delicious and the packaging is perfect. i kept circling back to her shop through out december finding the loveliest gifts for so many of our friends who appreciate the finer things in life. i hope her business thrives and that she is supported by the community. Thank you Marcy for your kind words. I love what I do and hopefully that shines through in all my creations. Trying to spread happiness, one chocolate at a time! Thank you Morley for stopping in and patiently waiting through the Valentine’s Day mad rush…… The journey as a chocolatier has been blessed with making new friends who stop in not only to pick up chocolates, but also to share what is happening in their lives…… Hope my chocolate creations will bring you back soon….